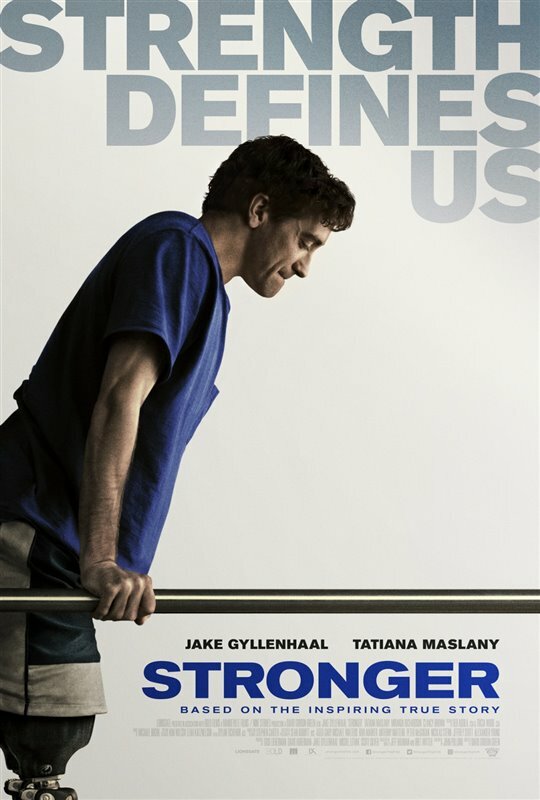 Adapted from his memoir of the same name, Stronger recounts the true story of Jeff Bauman (Jake Gyllenhaal), who was standing near the finish line at the Boston Marathon in 2013 to cheer for his ex-girlfriend Erin (Tatiana Maslaney), when two terrorists set off a homemade pressure cooker bomb. Jeff lost both his legs in the explosion, and came to be celebrated as a hero by people around the world, after the photo of him being helped by a man wearing a cowboy hat went viral, and he was able to aid in the investigation by identifying the bombers to police while in the hospital. While the bombing itself and the gripping manhunt that ensued loom heavy over this story, and are shown in the background mainly on television screens, Stronger largely focuses on Jeff’s internal struggle with being hailed as a hero merely for surviving the worst event of his life. Although his downtrodden mother (Miranda Richardson), whom he still lives with, and the rest of his working class family encourage him to capitalize on the newfound fame, Jeff finds himself struggling to adapt to his new life and patch up his relationship with Erin, having to reconcile himself to the fact that he was only at the finish line to cheer her on. Directed by David Gordon Green, making a departure from both his early indies and his later studio comedies, Stronger is a true story character drama done right, and the film is elevated every step of the way by its great cast. Jake Gyllenhaal gives an absolute powerhouse performance here, whether in moments when he is trying with quiet desperation to do things for himself like use the toilet and take a bath, or the scenes where he completely breaks down. The camera lingers on the expressiveness of his face, and he is able to say so much through a hint of sadness in his eyes or a slight quiver of his jaw. It’s a performance as courageous as it is devastating, and Jake Gyllenhaal throws himself into the intense physical demands of the role, serving to further cement him as one of the greatest actors of this generation. Tatiana Maslaney also does excellent work, showing quiet strength as the on-again-off-again girlfriend who has to balance caring for Jeff with looking after her own emotional and physical wellbeing. The last act builds with scene after scene of quietly gutting moments, before ending on an inspiring and bittersweet note, making Stronger a moving drama that sticks with us. A version of this review was originally published during the Toronto International Film Festival.